Every day that Truckee Meadows Water Authority (TMWA) runs its three hydroelectric plants at capacity, over 90,500 pounds of CO2 emissions are effectively eliminated from our atmosphere. That’s roughly 15,000 metric tons a year. Now, to be clear, there are dry years and maintenance issues that keep the plants from running at capacity all the time; but the fact remains, TMWA’s hydroelectric plants are one of the crown jewels in Northern Nevada’s green-energy portfolio. Even better, these clean, renewable power resources have been benefiting our community for over a century. Interestingly, even a hundred years ago the reason behind the hydro plants was to replace expensive, soot-producing coal power. By the late 1800s, Virginia City mines were so deep they required constant pumping to remove groundwater. Steam-driven, Cornish pumps had been effective for a while, but the expense of coal and a drop in the value of silver forced mine owners to seek a cheaper power alternative. 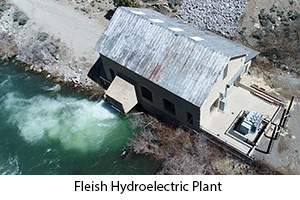 To meet this demand, the Farad Hydroelectric Plant was completed on the Truckee River west of Reno in 1899, followed by the Washoe, Fleish and Verdi plants in 1904, 1905 and 1911, respectively. Unfortunately, the Farad plant was irreparably damaged by the 1997 flood; however, the remaining three plants continue to produce 6.7 megawatts of clean energy to this day—enough electricity to power 3,500 households, annually. Essentially, the hydro plants produce enough energy to offset most of TMWA’s electrical power use in a typical year. If the output of the three hydroelectric plants was replaced by conventional coal, diesel or natural-gas-generated electricity, the resulting CO2 emissions would total at just over 1,200 metric tons a month—that’s 2,645,547 pounds! Of course, these are averages; the exact amount of C02 released depends on factors such as the type of fuel used and the efficiency of power-generation facilities. Still, it’s hard to miss the point: TMWA’s hydroelectric power production, in a very tangible sense, improves the quality of life for everyone in the Truckee Meadows. What makes the story of TMWA’s hydro plants even better, is that their value to customers extends beyond the environmental benefit. There is a real dollars-and-cents payoff, too. The estimated sale of TMWA hydro power to NV Energy in fiscal year 2018 will be over $3,500,000. This offsets approximately 60% of TMWA’s expected $5,000,000 energy cost over the same period. How does this difference translate to a customer’s water bill? Basically, it lowers water rates by about three percent. It’s hard not to love a power source that helps protect the environment while simultaneously keeping costs low for TMWA customers. TMWA’s commitment to hydroelectric production also aligns perfectly with the City of Reno’s conservation efforts under their ReEnergize Reno program—an effort we very much support. If you would like to visit one of TMWA’s historic hydroelectric plants, visit tmwa.com/events and see the tour schedule. The TMWA staff will be more than happy to show you around.